In Indonesia it is completely legal for children to buy and smoke cigarettes and Marlboro has been accused of profiting from this lack of regulation. I strongly encourage you to watch this video from ABC, listen to what the CEO of Marlboro has to say about advertising directed towards youth and the excuses that he presents. 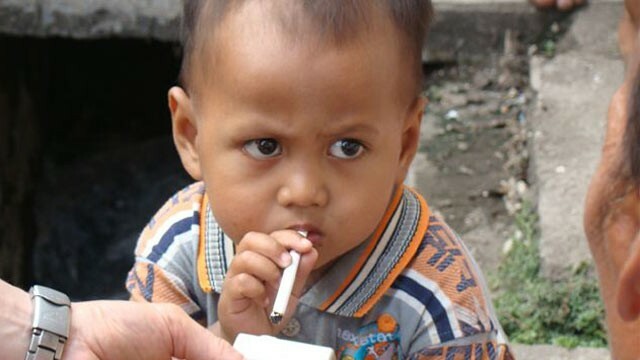 News reporter from ABC interviewed the ‘smoking baby’ and discovered a large number of ‘smoking babies’ living in Indonesia, grandparents even helping them to light their cigarettes, hoping to become well-known as the first boy did. Advertisements for Marlboro are posted right outside an entrance to a school in Indonesia at a kiosk, sponsored by Marlboro Light where individual cigarettes can be bought for a dime. On the packaging for Marlboro they assure us that they do not direct their marketing towards children, but if that is so why are they allowing advertisements to be put up right outside a school, obviously targeting the children that pass by every day and selling cigarettes at the low price of a dime? Next Mad Men: Selling You More Than Just Entertainment.